As I mentioned a couple of weeks ago, I've finally got round to asking for some structured feedback from the mates who I've been testing Codename: Vacuum on. I really don't want to be that guy who keeps nagging his mates to play his game that they'd rather pluck their own eyes out with skewers than play. I don't want them playing it to avoid hurting my feelings; I want them playing it if they want to play it. Playtesting is different to gaming. You play a game that's often crap or broken, each time you play it the rules or components are different, sometimes you have to abandon a game halfway through because it doesn't work and then after all that you're expected to give feedback and constructive criticism. Not all gamers enjoy playtesting - and with good reason. So the system I came up with to avoid being that guy, was to invite people to play Vacuum with me once. If they wanted to play, they had to email me. If they wanted to play again, they had to email me again. No nagging, no guilt, just helping out if they felt like it and enjoyed it. Seven of my mates at work are on the Games Night email list (though not all of them come) so I invited them and left it at that. All of them took me up on the offer. Most of them have played between two and five times, a couple only once. Two of them want to play pretty much every week. What I was most interested in was: why do the five who don't want to play every week not want to play every week? What is it about Codename: Vacuum that has left them feeling cold? Most of them are Software Engineers like me, so they understand the value of critical feedback. I asked them for answers to a simple questionnaire, and for them to be critical in particular - no sugar-coating! By far the biggest criticism that came back from everyone was that the learning curve was steep and the wealth of available strategies overwhelming. At the moment the game has five 'standard' decks which you play with every time and ten 'advanced' decks of which you play five per game. Each deck has an end-game scoring condition which represents a valid (though not yet balanced!) strategy. In any one game there are ten available, each time you play half of those change (and in fact for my playtesters, they pretty much all change every time they play as the game evolves). People are finding it hard to take in the options and judge which ones are strongest for the given combination of available decks. It's bewildering. I understand all the scoring conditions, but then I wrote all the cards and think about them incessantly. My chief playtester Dave has got it (he recently royally owned me in a game!) but he's played it more than ten times. No one else has really. I guess I had seen this in action most times I've tried the game out, but I'd chalked it up to learning games and beginners confusion without really paying any particular attention to it. Getting these written answers to the questionnaires has really brought it into focus and flagged it up. If you are too overwhelmed the first time you play a game, then there's not much likelihood of you playing it a second time and any hope of a hit game and good sales have gone straight out of the window. But the concrete feedback has given me something to latch onto, and last week I had an idea in the shower. I going to try only five scoring conditions, one per standard deck. They'll be the same every game, and because there's only five of them, they can be simpler and easier to grok. The advanced decks will still exist, but they'll be there to help you in one or more of the standard scoring conditions. Time to try it out and see if it behaves like I expect. I've a playtest session on Monday lunchtime with a couple of mates from work. Another advantage of coming up with it at this point is that I hope to get copies to my friends in York and Bedford in the next week or so. I can give them both versions (before and after this simplification) and get them to compare and contrast. Sooner or later, our children must fly the nest and strike out on their own. My daughter is only six months old so, thankfully, that day is a long way off for her, but for Codename: Vacuum it's much closer. Until now, every single game of it has been played with my copy, with me playing and explaining the rules. As a result, the rulebook has been fairly simplistic, and for the last three months or so, quite out of date. Sadly, until a week or so ago, none of these were true of the Codename: Vacuum rulebook :(. My focus now is on getting it ready, so I can send games complete with rulebooks. First problem is that writing rules is hard. You need to be both complete, clear and unambiguous and also concise. You need to provide examples of anything that could be unclear, you need to expect that people reading it will get the wrong end of the stick. You need to have good grammar and the whole thing mustn't look like a dictionary. It's really hard. When I ran Reiver Games I had my friend Mal proof-read the rulebooks for me, and I got people to play the games from the rulebook and then tell me what they thought was unclear so I could improve that section. I got more feedback from people who translated the rules into other languages, and still at the end of all that there are plenty of people playing the games wrong or asking for clarification on BGG. And these were simpler games than Codename: Vacuum. This first draft of the rulebook won't be playtested before the guys down south get their hands on it (they are inadvertently doing the playtesting for me :) ) and it won't be proof-read, which just makes me more paranoid about getting it right. It'll be light on examples and illustrations too, but it's a step in the right direction. Acknowledgements: Thanks to playtesters, proof-readers, etc. For Codename: Vacuum I'm thinking of adding a description of all of the decks and cards between the scoring and acknowledgements covering exactly what you can and can't do with them and answering some FAQs. My aim is to get the playtest copies ready by the end of the month. This week is my quarterly hospital trip which involves four hours on trains, so I should be able to make some progress and maybe even build up a backlog of blog posts. But even with the train trips I've got my work cut out! For the last few months I've been making a new prototype of Codename: Vacuum roughly once a month. I'd play the last version a few times, come up with some new ideas to try out and then make those changes on the computer. Then it was time to realise it in physical form. I bought a Canon Pixma iX6550 last year and I've been very pleased with it. 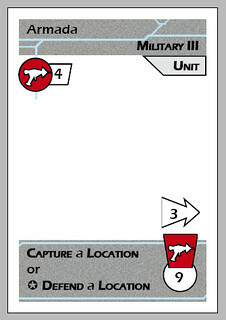 When printing cards for games I lay the cards out in a 5x5 grid on a sheet of A3 card. So, clearly, I need some A3 card. Codename: Vacuum is a deck-building game with 350 cards. So I need a lot of card. For the last few months I've been nipping to Ryman Stationery or Hobbycraft to get more card. They both sell A3 white card in packs of 25, so with the 17 sheets of card per copy of the game, I'm getting through quite a lot of packs! Hobbycraft has been my preferred stockist, their packs are £5 and are 210gsm card - which feels a reasonable thickness and weight for prototype game cards. Ryman's conversely are £6 and only 160gsm which feels cheap and flimsy by comparison. So why do I ever go to Ryman? Because Hobbycraft are often out of stock - Ryman has been my fallback position if I need card at short notice and Hobbycraft have failed me yet again. Since I need almost a full pack per game and I'm making roughly a game a monthly, trips to Hobbycraft for the inevitable disappointment of no stock followed by a trip into town to get the flimsy Ryman offering are regularly required. As I mentioned at the beginning of the year I'm hoping to get playtesting copies to friends this month and more out in the summer - I'm going to be making a lot of copies. It doesn't make sense to continue to buy lots of these little packs when I need sheets a hundred or more at a time. 3 inch thick pile of card! Manly. 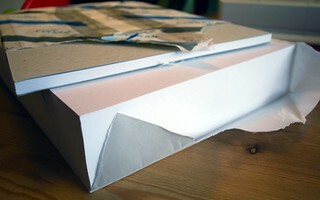 I placed an order online with PaperCutz for 250 sheets! I've also gone with a heavier weight than even Hobbycraft sell: 240gsm. Having such a large stock will mean I don't need to keep making these disappointing trips and mean that when I'm ready to make a new copy I've got enough card to print it straight away. I also ordered 25 sheets of really heavy 300gsm card making for box inserts. If you're going to do a job - might as well do it properly :). After my very unpopular question for artists a few weeks ago (which nevertheless is now one of my ten most popular posts of all time!) I've been making a few changes to the layout off my own back. The last version (which was wheeled out for the first time at the beginning of the year) had a few changes to the cards, a few changes to the rules and quite a lot of changes to the design. I'm now working on another version which I hope to get to the table this week (assuming I can find some card on which to print - I went to Hobbycraft to get some more on Saturday and for the second time it was out of stock :( ). This latest version further adds to the graphic design as well as trying out some very new card ideas and trying to streamline the rules a bit. 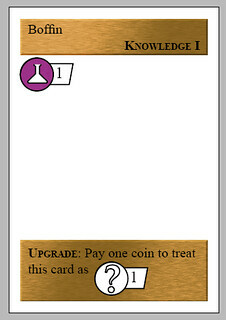 The first thing I've done on the design front is to try to differentiate between the three levels of strategy card. These levels theoretically correspond to 1900s, 2000s and 2100s technology, so I wanted the cards to have a flavour of that. Previously with the slight exception of a number representing the level in the top-right corner, the cards all looked the same. It would be nice if this was a bit more steampunky, with cogs and leather and copper tubes, but I have to admit my limitations and keep it simple. 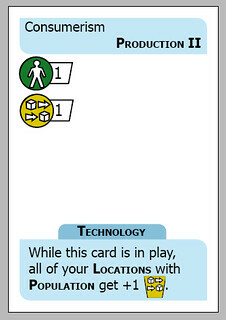 The latest version, yet to make it into physical form also includes some border art for the futuristic 2100s cards. This is the weakest of the three to my mind, but hopefully feels vaguely futuristic! So, you can see why I wanted an artist a few weeks ago - this is not my strong suit! But hopefully, this basic graphic design/border art gives a flavour of the three ages of cards. I'm also trying to streamline the game a bit with this new version. One of the things that has been in the game for at least six months is that you have to pay upkeep on population above and beyond the basic population that a location comes with when you acquire it. At the end of every turn, you had to pay some coins if you'd settled extra population on any of your location cards. Despite this having been in the rules for ages, and having personally designed the game this was something I kept forgetting to do, let alone my poor playtesters, who also have to cope with a new set of rules and cards every time they play. I've taken it out in this version, in favour of limiting the number of cards you can settle on a location - I figure it's easier to remember a restriction on things you can do at the point you do them, then remember a little thing at the end of every turn for the rest of the game! In other news, Mal suggested in the comments of the artists post that I approach the design school at the local uni to see if they'd be interested in offering the graphics design of Codename: Vacuum as a degree project. I think it's an excellent idea, now I just need to pull my finger out and get in contact!